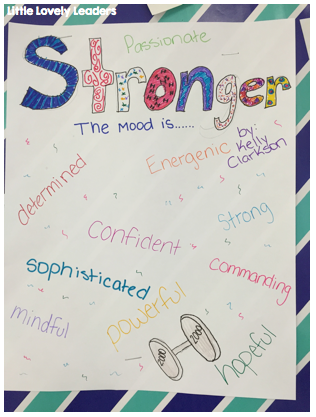 This past week I focused on teaching Author's mood. As I had this list displayed, I had my students take a look at it and ask about any words they felt that they were not familiar with (nostalgic, for example, was a common one). 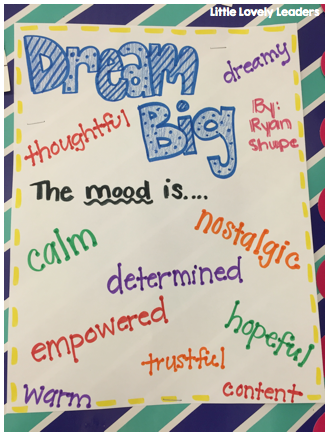 We discussed these words so that the students would be able to use them in our next activity. I now had my students split their paper into 6 different boxes and we did the most fun thing ever..... listened to music! My class was super excited about this! 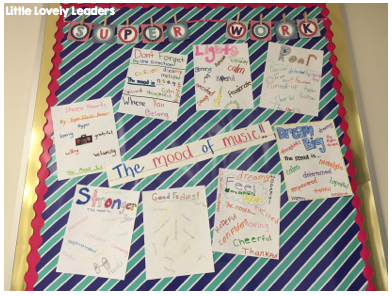 The objective - jot down the song title, listen to the song, and write down "mood words" in the box that you feel apply to the song being played. I then had the students separate into small groups of 2 or 3 and create a mini-poster for their song. (I assigned a song, which was previously played in our activity, to each group). 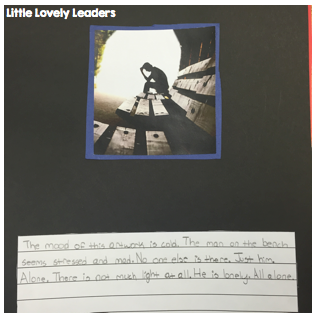 Below are a couple of examples of my students' posters they created after listening to their songs. The song is in the caption below the picture if you can't tell based on their poster, haha! All of the posters on our Super Work board ... The Mood of Music! 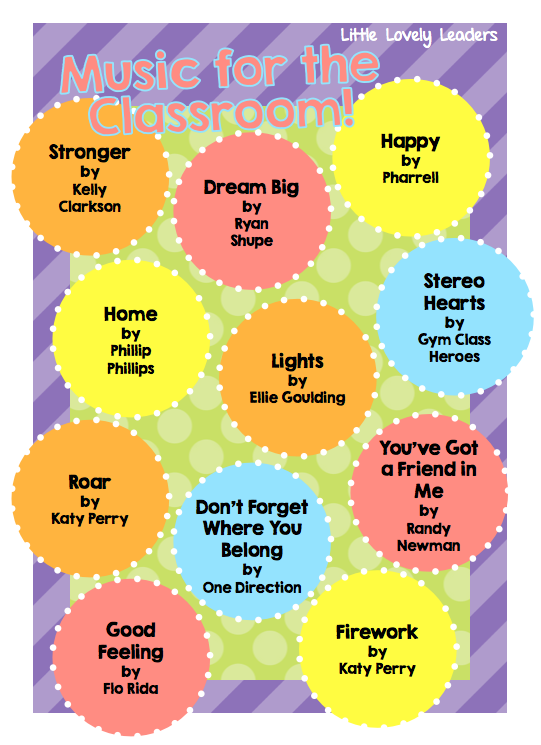 I know it is SO hard to find music that works in a classroom...appropriate music! Appropriate music that also appeals to our students is almost unheard of! I gathered a list of a few I really love! 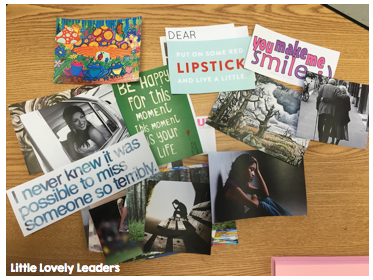 As we continued our week of Author's Mood, I had a new activity for the students. Now that they practiced using all of these new "mood words", I wanted them to show me that they could write with the words. 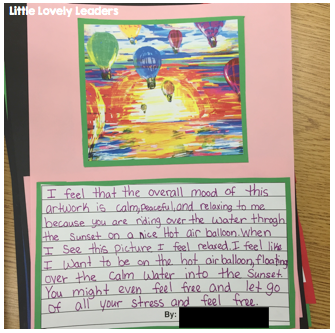 I printed out a bunch of photos and/or quotes from Google (you will find my collection of photos attached below in the PDF) and gave one to each student, randomly. 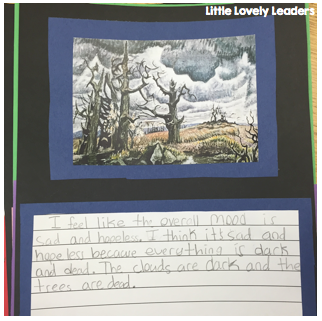 The students had to think about the mood the artist or author of the picture/quote was trying to express and then write about it. I wanted them to come up with more than one mood expressed by the picture/quote. 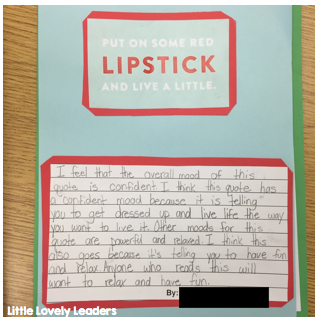 Then the students wrote their rough drafts. 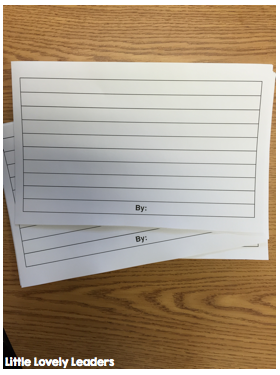 Once they had a few friends edit their work, they wrote their final copies on this little paper I printed out. 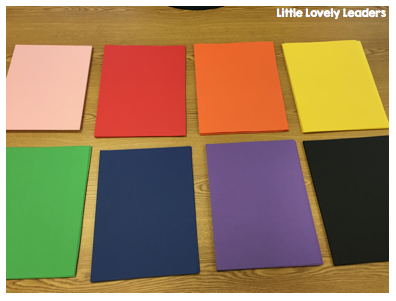 The picked their construction paper colors - also based on the "mood" of their quote or picture. I typed what they say below some of them, just in case it is too blurry. The mood of this artwork is cold. The man on the bench seems stressed and mad. No one else is there. Just him. Alone. There is not much light at all. He is lonely. All alone. I feel like the overall mood is sad and hopeless. I think it's sad and hopeless because everything is dark and dead. The clouds are dark and the trees are dead. I feel that the overall mood of this artwork is calm, peaceful, and relaxing to me because you are riding over the water through the sunset on a nice hot air balloon. When I see this picture I feel relaxed. I feel like I want to be on the hot air balloon, floating over the calm water into the sunset. You might even feel free and let go of all your stress and feel free. I feel that the overall mood of this quote is confident. I think that this quote has a confident mood because it is telling you to get dressed up and live life the way you want to live it. Other moods for this quote are powerful and relaxed. I think this also goes because it's telling you to have fun and relax. Anyone who reads this will want to relax and have fun. When I look at my picture the overall mood feels playful because the frogs look like they're friendly and they want to play around. 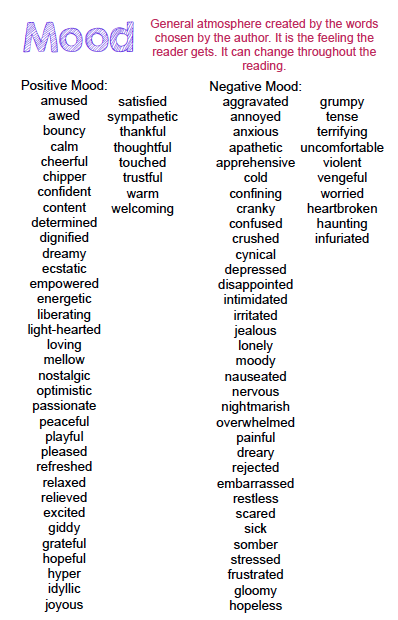 Other moods you might have [are] silly, happy, [and] calm. You might think happy because this whole picture has many different colors. It's colorful. This is the mood my picture makes me feel. The overall quote is sorrow. Sorrow means sad. I know this because it says tears and when you have tears you cry. Another mood is lonely. 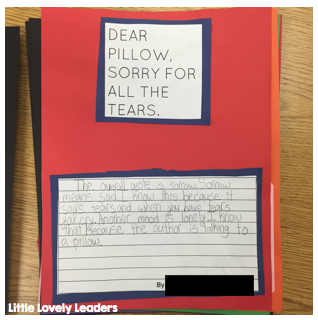 I know that because the author is talking to a pillow. 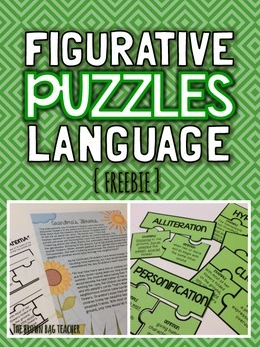 I feel that this activity suited my purpose because the students used the new vocabulary words I wanted them to use. They really seemed to use them successfully. I was really proud of them! out to my class for the second activity. 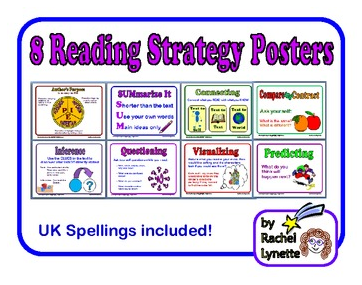 Keep in mind I used all of these activities along with the regular passage readings we use for reading practice. 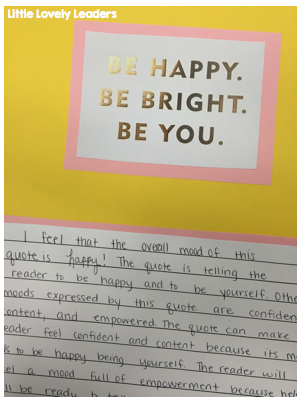 These activities alone will not teach students how to find the mood of a reading passage; however, I really feel that they broadened the students' knowledge of different words to express mood. 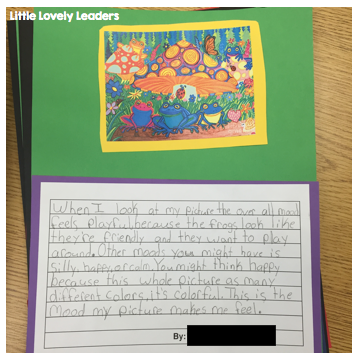 They did a really great job with our reading passages after these lessons, and it made them love picking the mood of a reading! The love for FREEBIES, that is! 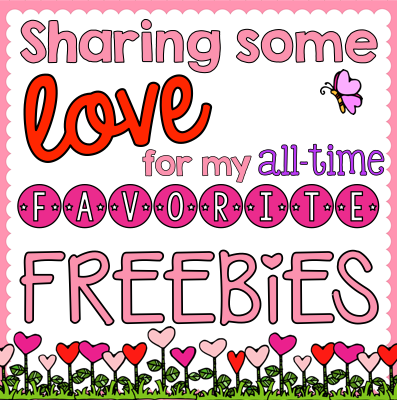 I am hoping that many of you will also want to link up to share your favorite freebies on your blogs! Feel free to steal the image below and link up! February is the month of love....for freebies! others, and then share one of your own freebies that you love! find everyone's posts! Thanks everyone! This will give everyone visiting your blog FIVE awesome freebies to check out! 1. 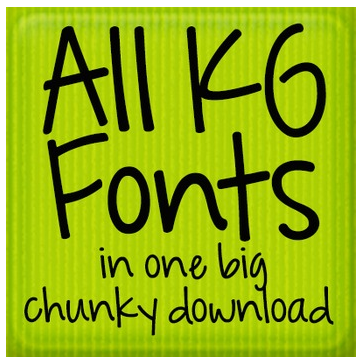 ALL Kimberly Geswein fonts...in one giant download! What is better than this? Nothing! Absolutely nothing! Kimberly Geswein is beyond amazing! 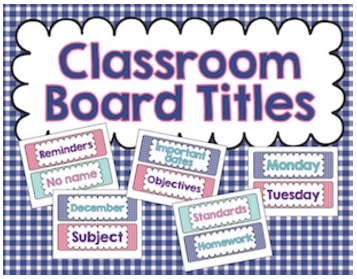 Of course, you will want to buy the license if you are using her fonts for use on your TpT products; however, you can download ALL of the fonts at one time and then use them on everything you create! I love using them in my personal e-mails! So fun! I put this in all of my students' math journals. They refer to it a lot in the beginning of the year, and then I start to ask them to try not to look at it. They really find it useful. I really find that it is useful for my ESOL students, because they are already not reading a test in their first language. This sheet really helps them during the year. They feel comfortable when looking at it, too. 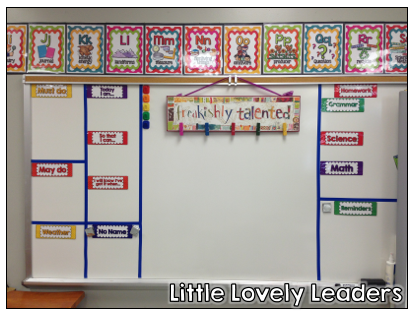 It is really easy to look at, organized, and cute :) This is a great time saver, and I love that it is all on one page. I really like these! I have just used them as posters in my room, but this year I actually put four to a page and gave the students these pages for their journals. 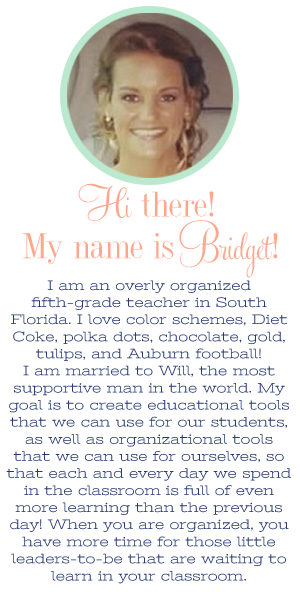 I really felt that they not only helped the students by being a reference, but they helped guide my teaching. I make sure to refer to them often, and use them as much as possible in each story we read. I really love the convenience of these! I have used them sooo much more than some of the other things I have downloaded! I did not find these until recently but I love them! 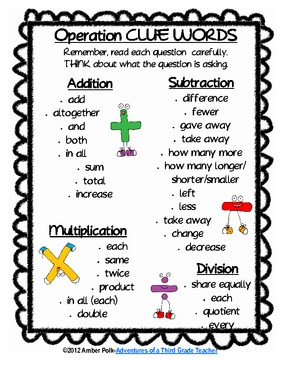 I use them as a center activity or as test practice/review when it gets closer to testing. They are easy, convenient, and fun for the kids. They make a really great review game that does not waste a lot of time. We all know we don't have that much time to review things when it comes down to wire, so it's great to have something like this that effectively reviews a needed skill! I use these little headings ALL of the time! I write my homework down and the subjects are clearly separated, I use them for my "must do", "may do", and "objectives" sections, and I also have "reminders", "weather", and MANY other sections in this pack. This pack is available in both a rainbow and a blue & pink version. I use these every single day, no doubt! Thanks for joining me in my linky party! Check out other bloggers below to see their favorite freebies! I would love if you would link up and post about YOUR favorites, too!